Explore the Chilkoot Trail, Taiya River, and White Pass Summit on a 6-hour tour from Skagway. 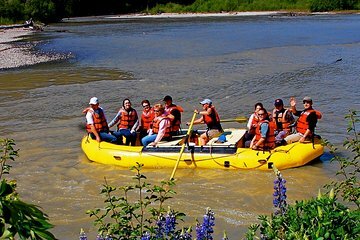 Learn about the Klondike Gold Rush during a short hike on the Chilkoot Trail, then float on the Taiya River aboard a stable raft. Finally, take a scenic drive north to White Pass Summit for sweeping views of the mountains, glaciers, and alpine lakes of the Yukon and British Columbia. Make a photo stop at the 'Welcome to Alaska' sign then pass through U.S. customs to return to Skagway.